Browse through a variety of resources designed to help you find the right solution for just about any specialty risk your clients may throw at you. You’ll find tip sheets, infographics, FAQs and videos to help guide you to the right product quickly. Found something you like? Save it, print it, share it! Your colleagues will thank you. PS: Check out the Quoting System Toolbox for step-by-step instructions on how to use our Quoting Systems! Essential coverage for homes of any age or occupancy. Use this sheet to choose the right option for a vacant home. Overview of property insurance challenges and recommended solutions. Quoting and issuing policies in AMsuite is easy! Check it out for yourself. How to Quote Vacant Guide will help you with your customer's vacant needs. Comprehensive protection for homes that don’t qualify for standard homeowners policy. Our underwriting experts answer your DP-1 and DP-3 questions. Choose the right Dwelling program every time with this visual guide. Compare and contrast our most popular residential programs. Quick video walkthrough of DP-1 and DP-3 programs. When a standard homeowner program does not work, our HO-10 will. Quick video how our HO-10 can help customers who don’t qualify for a standard HO-3 policy. All the details on our Manufactured Home policies. Learn why our Manufactured Home program is different. New products for Sitebuilt, Dwelling, Manufactured Home and Condo properties. Download quick summary. Available in AMsuite states only. Rental, seasonal and vacant coverage with replacement cost. Compares dwelling special with original DP-3. Flexible coverage for customers who just need the basics. Compares Dwelling Basic with original DP-1. Chose the right option for your landlord customers. Need seasonal home coverage? You’ll need this. Our underwriting experts answer your questions about Vacant property coverages. We are dedicated to providing manufactured home and all policyholders with a positive customer service experience. This infographic will help you decide which policy you should write. Match the property to the program with this checklist. See the wide variety of collector vehicles we cover. Watch this and see why, to some, vehicles are more than possessions. Watch this video to see how you can better protect collector vehicles. See the coverage options we offer on collector vehicles. See how Steve and Anne’s Honda Gold Wing isn’t a motorcycle, but their memory machine. See all the “memory machines” we cover. See all the motorcycles and off-road vehicles we cover. Show motorcyclists how they can secure bikes on the road and at home. Remind motorcyclists how they can enjoy a safer ride. Use this sheet to help motorcycle customers make the right bike buys. See all the cool coverage options we offer on snowmobiles. All the ways we cover bikes, scooters, golf carts and more! See why a genuine ATV policy is a must for off-road riders. Boat or yacht? We write both! See all the covered types here. Yes, we cover Jet Ski®, WaveRunner®, SEADOO®. Get the details. Learn how you can offer first-rate protection for medium-sized craft. Review all the coverage options we offer on boats. 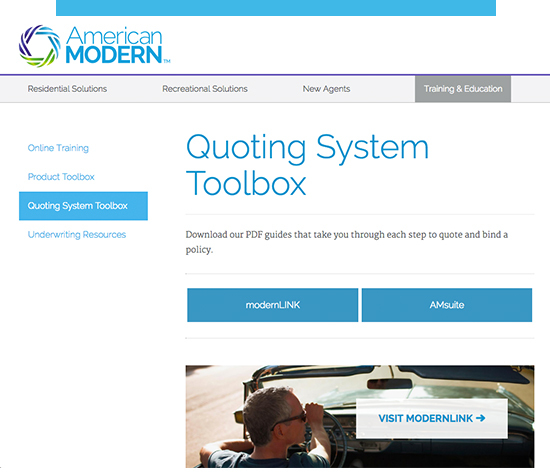 Pro tips to help you navigate quotes in modernLINK. Compares Homeowners with original Specialty Homeowner. Compares Manufactured Home with original Manufactured Home. Compares new Boat with old Boat in select states. Compares new collector vehicle with old collector vehicle in select states. Compares new Motorsports with old Motorsports in select states. Say "yes" for hard to insure properties. Learn how to best secure your collector car or motorcycle for spring and severe weather with these helpful tips. Keep these safety tips in mind to minimize your risk and protect yourself and your family in and around the kitchen. Many factors go into choosing a helmet. Learn more about them with this helpful infographic. Share this safety information with your customers this Thanksgiving. Share this safety information with pet parents. Stuck on a screen in modernLINK? Forgot your password? Need help signing a customer up for EZPay? Worry no more. Download simple how-to guides right here!